Here are some real good reference books on the Waffen-SS! Why a separate page for that? I dunno, this is a popular subject and I have them all in one handy place. Email me if there's a book you think I missed that should be in here. This book, Waffen-SS Uniforms: In Colour Photographs is, without a doubt, a MUST HAVE for any WWII library! Although I have seen a reviewer state that the uniforms were mostly reproductions, he is wrong, as pretty much everything in this book is real! You won't get this kind of great colour photos in any book this cheaply -- if you don't buy it, you're an idiot! This book is a unique reference source for the uniform collector, modeller and student of military dress and equipment.For the first time the reader can trace the development of the colour and design of the Waffen-SS uniforms with confidence: all the uniforms worn in the 150 colour photographs presented here are rare, original items, from private collections. All major types of service uniform are illustrated, together with a full range of the unique camouflage clothing which was the hallmark of these much-feared divisions.Privates, NCOs, officers, infantrymen, mountain troopers, tank and assault gun crews are all vividly illustrated here as they appeared on the actual battlefield, and described in detail. When this book came out, it was groundbreaking, and today, it is STILL a very good book. All the patterns used by the formidable troops of the Waffen-SS, from the first revolutionary designs of the late 1930s to little-known innovations of 1945, are explained and illustrated by means of more than 120 colour photographs of rare, original surviving specimens. The book also covers similar and derivative patterns used by German and foreign armies up to the modern day; and gives invaluable advice on the identification of original wartime uniforms. Useful for collectors, uniform historians and military modellers alike, this title aims to resolve the confusion surrounding this subject and establishes and complete and concise system of identification and terminology. Despite being disdained by the German Army’s professional officer corps, the military branch of the Nazi SS security organisation grew from an initial strength of only a handful of battalions at the outbreak of World War II in 1939, to hundreds of thousands of troops in dozens of divisions. The battlefield reputation of the premier armoured and mechanised divisions would become second to none; lavishly equipped and regarded as utterly reliable, they were thrown into many desperate battles on both Western and Eastern fronts, often achieving remarkable results. Illustrated with rare photographs, this first of four Men-at-Arms titles details the organisation, uniforms and insignia of the Waffen-SS. The military branch of the Nazi SS security organisation grew by the end of World War II (1939-1945) from a handful of poorly regarded infantry battalions in 1939, into a force of more than 30 divisions including units of every type. Their battlefield reputation varied widely, from the premier armoured divisions which formed Germany's utterly reliable spearheads on both main fronts, to low quality 'anti-partisan' units. The divisions covered in this second of four titles include the first mountain and cavalry units, and two of the remarkable new Panzer divisions raised in the great 1943 expansion. Illustrated with rare photographs from private collections, the text details their organisation, uniforms and insignia, and summarises their battle record. The Waffen-SS grew from a handful of obscure infantry battalions in 1939, to a force of more than 30 divisions by the end of World War II, including units of every type and every level of battlefield value. The mid-war divisions covered in this third title represent that range, from some of the most effective German and Western European volunteer formations – e.g. the 12. SS-Pz Div 'Hitlerjugend', and the Scandinavians and Dutchmen of the 11. 'Nordland' and 23. 'Nederland' divisions – to the Bosnian Muslims of the anti-partisan 13. 'Handschar' Division. Illustrated with rare photographs from private collections and meticulous colour artwork, the text details their organization, uniforms and insignia, and summarizes their battle records. In the last years of World War II, 1944–45, the Waffen-SS formed many nominal 'divisions' from a motley range of sources, whose battlefield value was as varied as their backgrounds. The best were built around existing Western European volunteer regiments; some, raised from Central Europeans and Russians, were strong in numbers but weak in morale; some were of negligible size, scraped together from remnants and trainees; and some were sinister 'anti-partisan' gangs, assembled from the military dregs of the Eastern Front. Illustrated with rare photographs from private collections and meticulous colour artwork, this final title in our sequence details their organisation, uniforms and insignia, and summarises their battle records. Originally written while the author was a prisoner of the US Army in 1945–46, Black Edelweiss is a boon to serious historians and WWII buffs alike. In a day in which most memoirs are written at half a century’s distance, the former will be gratified by the author’s precise recall facilitated by the chronologically short-range (a matter of one to seven years) at which the events were captured in writing. Both will appreciate and enjoy the abundantly detailed, exceptionally accurate combat episodes. Even more than the strictly military narrative, however, the author has crafted a searingly candid view into his own mind and soul. As such, Black Edelweiss is much more than a "ripping yarn" or a low-level military history. Black Edelweiss joins not only the growing body of German military memoirs, but the more select, more narrowly-focused group of personal memoirs by other Waffen-SS enlisted men. Beyond the microcosmic view of combat these books relate—to the extent that they are honest and candid—such books are important for what they can reveal about their authors’ motivations and reflections on those impulses and their consequences. To date, these works differ significantly. As it joins the ranks of the books in this genre, Black Edelweiss makes a unique and very important contribution. It is a true, personal account of the author’s war years, first at school and then with the Waffen-SS, which he joined early in 1943 at the age of seventeen. For a year and a half, the author fought as a machine gunner in SS-Mountain Infantry Regiment 11 "Reinhard Heydrich," mainly in the arctic and sub-arctic reaches of Soviet Karelia and Finland, and later at the Western frontier of the Third Reich. The characters in the story are real, and the conversations and actions are recounted to the best of his ability from the short distance at which he wrote the manuscript in 1945–46. Apart from the piercing insights into the question of why the German soldier fought as he did, what makes this book truly unique is the author’s anguished, yet resolute examination of the dialectic between the honorable and valorous comportment of his comrades and the fundamentally reprehensible conduct of about 35,000 men behind the front lines who nevertheless wore the same uniform. During his captivity, the author was assigned for a time as a clerk to a US Army Judge Advocate General’s Corps officer, and in the performance of his administrative duties, the author had access to the mounting reams of documentation of the Holocaust. His growing recognition of the involvement of Waffen-SS personnel in the monstrous crimes of that process caused him to dig deeply into his soul, to examine his most intimate and private motivations and thoughts, and to reevaluate the most basic assumptions of his life to that point. The author captured this process and the result in the notes which became this book. Honestly, forthrightly, and courageously told, Black Edelweiss is a precious gift to historians and other students of World War II. It not only provides a glimpse into the attributes that made the German armed forces a formidable and tenacious foe, but squarely confronts the most painful issue facing German World War II veterans in general, and Waffen-SS veterans in particular. Supported by 22 photos, 8 maps, and notes. The handbook for the collector and reenactor of German Army combat uniforms, equipment, and weapons for the period of 1939 - 1942. Contains first hand accounts of action in France and Russia. Also included is the Soldat Guide to European Museums and Battlefields. The premiere volume of the Soldat series; with this little book it all began. Contains details of the uniform, equipment, and weapons of the German Army Combat Soldier of 1943. SOLDAT is designed as a handbook for the collector of German Army combat uniforms, equipment and weapons. This volume provides not only current, detailed photographs of combat uniforms and individual equipment of the foot soldier, but also a look into his life and time in the critical years of the war, 1944 and 1945. The detailed photos in SOLDAT provide the military modeler with needed exacting details and the color plates will provide exact color references of combat uniforms, equipment and weapons. The "alte Hase," the combat veteran, provides the collector with a link to the stories and ideas of the foot soldier. Volume III is the second in a multiple volume series that will provide the collector with a handy reference book on the German Army foot soldier through the war years of 1939 through 1945. Future works of SOLDAT will expand further into the life and times of the foot soldier. SOLDAT Volume Ill is a perfect reference for anyone interested in the subject of combat uniforms and equipment of the German Army foot soldier in the Second World War. SOLDAT will continue to grow with the hobbyist. The first Soldat to deal with other than Heer troops. Researched by Richard Mundt, this book is a detailed study of the Waffen-SS Panzer Divisions. Filled with unpublished period photos and close up, new photos of insignia, this book provides a new look at an always-topical subject. Soldat, Vol. 11: Reproductions—The Post War Years. This is the book that will refund you its cover cost the first time you spot a fake and put it back on the dealer' s table! Filled with hundreds of detailed photos of FAKES with step-by-step tips for identification. Arm yourself! "I just got a copy of Cyrus Lee's new book Soldat XI C about reenacting the German impression. If your unit does not have a handbook then you should buy this book and hand them out to your unit. It really covers just about all of the subjects that we need to know for reenacting. Wonderful explanations and plenty of pictures for everyone to see. Excellent job on the book. I highly recommend this book, and not just because some of my units pictures in it. It's worth it for the sections on language skills, tactics, and drill. Marshall Wise's "Building a Persona", page 120, is something we all need to do to improve our impressions. I always believed that it's the "details, details, details" like simply wearing and carrying your Erkennungsmarken or Soldbuch. No one sees them but you know that at least your carrying it like the 8 million men did in the Wehrmacht." There have been all manner of books written on the German Army since the end of World War II. Books on the men, their tactics, commanders, equipment, weaponry and histories of the major battles they fought in can be found on the bookshelves of almost all 20th Century history enthusiasts. Deutsche Soldaten is a stunning visual history of the German soldier and provides a unique reflection of how the men lived, ate, and washed themselves on the front, or behaved when at rest, what were their pastimes, ambitions, worries and how they spent their leave, through the collections of personal items and other artifacts they left behind. The author, an expert on 20th-Century military history and an avid collector of military items from many different armies, makes available to the general public for the first time all these artifacts which he has collected over the years in order to create this complete illustrated history. This book can best be understood as a G.I. Collector's Guide (Histoire and Collections, 2005) for the German soldier. The treatment is very similar with page after page of pieces of uniform and equipment the even the most knowledgeable collector will find new items amongst. There are a great many close up photographs that will be invaluable for collectors looking to see what the genuine article looks like. Lavishly illustrated with thousands of color photographs, this large format book is being jointly produced by Casemate and Andrea Press in Spain. To gain a full understanding of the level of detail contained in the book, please visit our website where you can see a selection of sample spreads. Uniforms and Traditions of the German Army: 1933-1945. Vol 3. Detailed colored guide to the many uniforms of the German Army 1933 to the end of WWII in 1945. The book also describes traditions of the Wehrmacht during this period. Under the Nazi regime, Hitler's conservative views on the place of housewives and mothers in society limited German women to a much less active role in World War II (1939-1945) than their British and Allied counterparts. Nevertheless, the demands of a prolonged war did see German women in a range of uniforms as auxiliaries with the Army, Navy, Air Force and SS, particularly in the signals and air defence services. This unique book explains and illustrates these organisations and their uniforms and insignia, as well as Red Cross nurses, and auxiliaries of the Labour Corps, Customs Service, National Socialist Women's Organisation, and League of German Maidens (Hitler Youth). I bought this years ago and was kind of disspointed. It is a translation of a German book titled: "Waffen-Arsenal Waffen und Fahrzeuge der Heere und Luftstreikrafte Waffen und Ausrustung der Deutschen Gebirgstruppe im Zweiten Weltkreig". The booklightly covers the weaponry, uniforms and other equipment of the Gebirgsjager as used on all fronts throughout World War II. This book is not very thick, but is wall to wall actual photos of the German Mountain forces and their equipment. Photos also include Order's of Battle. 48 pages, not counting covers, which also have photos. The Order of battle for 1 Gebirgs Division and a bunch of good photos are not enough to make a good book. Most photos might be found elsewhere (like in excellent Kaltenegger's 'Photographic chronicle of the elite Gebirgsjager'). The title is somehow misleading--most of equipment and weapons are described in text only very briefly and not illustrated properly with photos or drawings, apart from maybe artillery pieces. From the earliest planning stages of the German counter-offensive in the Ardennes during World War II (1939-1945), Hitler was convinced of the importance of taking the Meuse bridges. He resolved that, when his forces broke through the US lines, one special unit should be dressed in American uniforms and issued with American weapons and vehicles. In this guise they could take advantage of the surprise and shock of the breakthrough, and move forward to the Meuse bridges as if they were retreating Americans. Jean-Paul Pallud details their organisation and the fateful sequence of events that followed. The 1930s were a time of growing tension for the smaller states of Eastern Europe. Since the end of the First World War they had enjoyed an independence which most of them had not known for centuries, but this was now threatened by the growing power of Nazi Germany and Soviet Russia. Instead of combining for self defence, they were bitterly divided. The Munich crisis of 1938, which served as the prelude to World War II, showed how little reliance could be placed on the Western democracies, whose power to intervene militarily in Eastern Europe was negligible. In effect this left the smaller East European states with little alternative but to become clients of either Germany or Russia. The Mountain Troops of the German Army in World War II were an elite of a special kind. Unlike the Panzer units, they did not field the mot modern equipment of their day. Unlike the Waffen-SS, they were not hand-picked for their Nazi loyalty. If anything, the respect attracted by their special cap and their Edelweiss insignia was earned by rather old-fashioned military virtues - by sheer physical prowess, in uniquely testing conditions. The Gebirgsjager had to be able to do what other soldiers did - but in places where no other soldiers had the strength and the skills to go, and often in weather no other soldiers could face. Few branches of the German armed forces were represented on so many fronts as the mountain infantrymen, or Gebirgstruppen. From the Blitzkrieg campaigns of 1940, through the invasions of the Balkans and Russia and the North African campaign, to the defence of the Reich 1944-45, the Gebirgsjäger earned a reputation for reliability and courage. Typically each trooper was a supremely fit individual: the need to cover difficult terrain in full kit, without the back-up of a motorised baggage train, demanded this. This new volume examines the recruitment, training, and combat experiences of the common Gebirgsjäger. It is often forgotten that the German Wehrmacht of 1939-45 relied heavily upon horses. Not only was the majority of Army transport and much of the artillery dependent on draught horse teams; the Germans also kept a horse-mounted cavalry division in the field until the end of 1941. After withdrawing it, they discovered a need to revive and greatly expand their cavalry units in 1943-45. The Army and Waffen-SS cavalry proved their worth on the Russian Front, supported by other Axis cavalry contingents - Romanian, Hungarian, Italian, and locally recruited. In this book an experienced horseman describes that last generation of horse-soldiers in a text supported by tables, photographs, and meticulous colour plates. The wartime Police were headed by Himmler as chief of the SS; and throughout the occupied nations the regional SS commanders were specifically termed 'Higher SS and Police Leaders'. Hitler's police was not a single service, but a vast machinery which included many special categories ranging from conventional criminal detectives, and municipal and rural police to combat battalions sent to Russia, and from border and customs police to special railway and waterway departments, fire brigades and emergency engineer squads, and even a colonial service for North Africa. The author explains the origins, the complex organization and the particular duties of the many different police branches that formed such a critical part of the Nazi apparatus and ensured that control was maintained inside Hitler's Fortress Europe. His painstaking research has unearthed fascinating new information about the German police services and their many different uniforms and insignia, which are recreated in the meticulously detailed color artwork. In 1919 Adolf Hitler joined the tiny German Workers' Party (DAP) in Munich, becoming its leader the following year and adding 'National Socialist' to its title. Thus the NSDAP, popularly known as the Nazi Party, was born. All political parties had strong-arm squads to protect their meetings from disruption by rivals, and the NSDAP was no exception. In August 1921 ex-naval Lieutenant Hans Ulrich Klintzsch took command of the NSDAP's 'Defence and Propaganda Troop' which, the following month, was renamed the SA (Sturmabteilung = Storm Detachment). David Littlejohn's fine text examines the history, uniforms and insignia of Hitler's stormtroopers prior to and during World War II. The SS originated as Hitler's personal bodyguard and following his rise to power in 1933 the organisation divided into two: the Waffen-SS, which comprised the military wing, and the Allgemeine-SS, whose role was to support the police in maintaining order. The Allgemeine-SS had a wide-ranging effect on all aspects of life in Nazi Germany, from enforcing Hitler’s racial policies through to the running of over 500 factories in Germany and occupied Europe. While the more visible armed SS combat units naturally received all the publicity, especially during World War II, it was the rather faceless Allgemeine-SS which wielded the real power. Examines the uniforms, insignia, personal equipment and weapons of the fighting men of all major armies of World War II. Rare, original uniforms and equipment are modelled and photographed from a variety of angles. Each example is accompanied by text identifying the items illustrated. Cutting edge when it was new--still worth having! Probably the most highly motivated and ruthless combatant to take the field in World War II (1939-1945), the Waffen-SS soldier was the cutting edge of Germany's military might. Aggressive in attack, dogged in defence, his units generally suffered higher casualties than the regular army formations. The apple of the Führer's eye, he was the first to receive the best available equipment and was expected to produce results to match. From the green fields of France to the freezing steppes of Russia and finally to the shattered streets of Berlin this title details the development of the weapons, equipment and tactics of one of history's most formidable soldiers. In the early 1920s, a tiny group was formed within the SA to serve as Hitler's personal bodyguard. Originally labelled the "Stosstruppe Adolf Hitler," they later became known as the SS – Schutz Staffeln, or "protection squads." From these humble beginnings, the SS rose to a nominal strength of 38 divisions of over 800,000 men by 1945, representing a sizeable portion of Germany's land forces and more importantly a quarter of her tank forces and a third of her mechanised infantry. Martin Windrow provides a splendid in-depth review of the history, uniforms and insignia of the infamous Waffen-SS of World War II. The German Army of World War II (1939-1945) collectively referred to its various engineer units as Pioniere--what would be called combat engineers in the West. This organization included Pioniertruppen (Pionier Troops), Bautruppen (Construction Troops), Eisenbahntruppen (Railway Troops), and Technische Truppen (Technical Troops). They were first and foremost assault troops, and construction workers second. They were tasked with overcoming manmade and natural obstacles, and in the attack they supported the infantry as specialist assault troops, attacking fortified positions with demolitions and flamethrowers. In the defence they constructed fortifications and shelters, erected obstacles, laid minefields, planted booby traps, cleared fields of fire, erected camouflage, and maintained supply routes. This book examines the recruitment and special training of a German Pionier. It also covers life in the field while on campaign and the of a Pionier role in supporting infantry assaults. This large format colour-illustrated book shows a wide range of the uniforms and personal equipment of the Waffen SS during World War II. Coverage includes peaked and soft caps, helmets and camouflage helmet covers, tunics and camouflage jackets, insignia and miscellanea such as belt buckles, shoulder straps, documentation, and so on. Amongst the rare items of equipment are named articles from SS generals and colonels.Interest in this subject remains extremely high, and the authors have traveled widely in Scandinavia and Russia photographing previously unseen collections. The photographs are accompanied by an explanatory text making this an invaluable book for military historians, modellers and collectors. The remarkable war effort of the German armed forces on three fronts between 1939 and 1945 was recognised by a wider range of insignia than seen in the Allied armies. While the Wehrmacht displayed fewer unit insignia than the Allies, a glance at a German soldier's tunic could reveal much more about his actual combat experience. In this book an experienced researcher explains and illustrates the Battle and Assault Badges of the Army, Waffen-SS and Luftwaffe ground troops of World War II; the sleeve shields and cuffbands issued to mark service in particular campaigns; wound badges, commemorative medals, and other types of insignia. An exhaustive, clearly written, illustrated compilation of information about the German war machine from 1939 to 1945 covers military command structure, unit organization, field tactics, fortification, weapons and other equipment, uniforms and insignia. One of the old stand-bys on details of the German Armed Forces. Contains information not only on the various types of equipment in use, but also information on training, supply, organization, etc. This new book is the follow-on work to the author s well-received Rations of the German Wehrmacht in World War II. Aided by the discovery of a large body of wartime British Government intelligence reports this volume helps to further unravel the mysteries of the wartime German food industry. Utilizing the successful formula of the first book this volume addresses the Special/Emergency rations of the German military, the feeding of the German soldier during offensive operations, as well as offering a comparison of the German and U.S. Army ration organizations. Lavishly illustrated with photographs, charts, wartime advertisements, and other educational aids this book is a must for every serious collector and historian of the German military in World War II. This book is the definitive reference on the topic. Lavishly illustrated with over 600 photographs and over 200 charts, wartime advertisements and other educational aids, it represents the most accurate and detailed look at the rations provided to the German soldier in World War II. Relying mainly on wartime German and American references, most unknown to the general public, this book dispels the many myths associated with German rations of World War II. Covering all the major food groups Emergency and Special rations, Scho-ka-kola, the supply system and wartime packaging materials and construction this book is a must for every serious collector and historian of the German military in World War II. All color with models wearing the uniforms and some equipment in semi-realistic poses. This will give you a good feel for what the "real" stuff looked like. The only downside is that the English translations are kind of poor. All branches of the German armed forces are depicted in large, full-color photographs, including some unfamiliar subjects, such as the best display ever of SS tropical uniforms (for wear in Corsica and Italy), and an extensive section on the SS-controlled Order Police. This full color illustrated book covers the highly collectible World War II era German visor cap. Officer and enlisted caps of the Heer, Luftwaffe, Kriegsmarine and Waffen-SS are shown in over 360 high-quality photographs, and described in detailed text. Rare and common caps are presented in both full view and up close detail showing insignia, piping, and manufacturer's tags/markings. Caps in wear are also shown in war era portraits of officers and enlisted men from the various Wehrmacht service arms. The only comprehensive photographic book on Waffen-SS uniforms is finally available! This three volume set is unquestionably the best reference on German SS military uniforms ever produced. After many years of research and preparation, Mike Beaver, author of Camouflage Uniforms of the Waffen-SS, has again produced another breakthrough publication. This spectacular work is a heavily documented record of all major clothing articles of the Waffen-SS. Hundreds of unpublished photographs were used in production. Original and extremely rare SS uniforms of various types are carefully photographed and presented here. Among the subjects covered in this multi-volume series are field-service uniforms, sports, drill, dress, armored personnel, tropical, and much more. A large updated chapter on SS camouflage clothing is also provided. Special chapters on the SD and concentration camp personnel assist the reader in differentiating these elements from combat units of the Waffen-SS. Difficult areas such as mountain and ski troops, plus ultra-rare pre-war uniforms are covered. Included are many striking and exquisite uniforms worn by such men as Himmler, Dietrich, Ribbentrop (father and son), Wolff, Demelhuber, and many others. From the enlisted man to the top of the SS empire, this book covers it all. 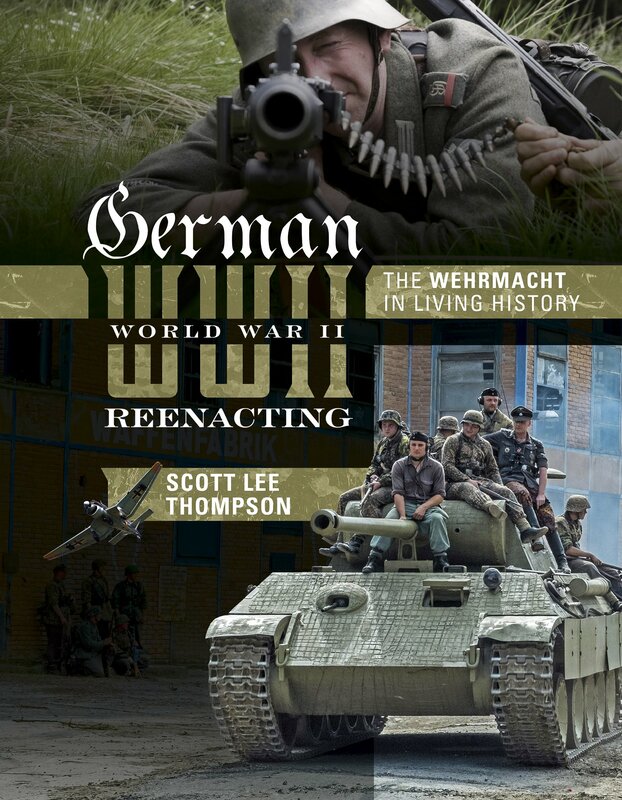 This book is indispensable and an absolute must-have for any serious historian of World War II German uniforms. Volume 2 covers: 1942, 1943, 1944-1945, Ski Uniforms, Overcoats, White Service Uniforms, Tropical Clothing. Volume 1 covers: Black Service Uniform, LAH Guard Uniform, SS Earth-Grey Service Uniform, Model 1936 Field Service Uniform, 1939-1940, 1941. The equipment of the German Soldier, at the beginning of the Second War, was strongly inspired by the Veterans of the Great war, despite the adoption of some new materials between the two wars, including the colorful canvas tent, particularly original for its time. This guide describes in detail the main variations of each piece, from the bayonet canister to the tank, gas masks. the individual tools, etc. This is a valuable tool for the collector, modeler and military historian. Have you ever been obsessed in war history, particularly about World War II? You have seen reenactments of that significant moment in our time that you are thinking of participating in such an endeavor. However, you don't know how to start. Fret no more. David Hustler, a veteran of many reenactments of historical battle events, is giving you the head start by imparting tips of the ins and outs of perfecting your own impression of a soldier of the Second World War. He will guide you from buying the proper uniforms and equipments to joining your own group or units, and from the right way of caring for your costume and implements to maintaining a good attitude in the field. Avoid being called a farb on your first day as a reenactor. Follow the expert.